Born in Volterra, Italy, Granacci was a Renaissance painter who studied alongside Michelangelo (1475 – 1564) under Florentine artist, Domenico Ghirlandaio (1449 – 1494). During this time the young Granacci and Michelangelo also studied with the sculptor Bertoldo di Giovanni (1425 – 1491) in the Medici’s garden in San Marco. Granacci’s earlier works were well executed, but lacked a personal expression, mostly imitative of Ghirlandaio and his contemporary, sometimes collaborator, Filippino Lippi (1457 – 1504). This included his pieces, Enthroned Madonna between Saint Michael and John the Baptist, Adoration of the Child, and a series of Saint John the Baptist. Of the latter piece, the panel of Saint John the Baptist Preaching, now at the Metropolitan Museum of Art in New York, is said to be the superior of the series. His style began its distinction, partially due to a trip to Rome in 1508, where he assisted his old friend Michelangelo briefly in the Sistine Chapel. Granacci’s work, Rest on the Flight into Egypt, is said to show a more sculptural composition of his figures, influenced by Michelangelo. The piece also has more expressive attributes in its exotic setting and radiant colors. In his return to Florence he painted in the convent of Saint Agostiniani of San Gallo, as well as the decorations for Pope Leo X’s visit to Florence. In 1515 he was commissioned by Pier Francesco Borgherini, collaborating with Andrea del Sarto (1486 – 1531) and his pupil, Jacopo Pontormo (1494 – 1557), as well as Francesco Bacchiacca (1494 – 1557). His piece here, Joseph Presents his father and his Brothers to the Pharaoh, is now in the Uffizi Gallery. 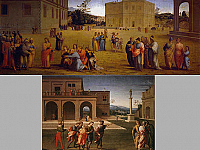 Granacci’s later works began to infuse the influence of artists such as Fra Bartolomeo (1472 – 1517) and Pietro Perugino (1446 – 1524), of the Umbrian School of painting. 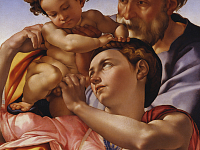 Of Bartolomeo’s influence, is Granacci’s Madonna in throne between Saints Sebastiano and Francesco and Perugino’s influence is seen in Granacci’s Assumption. He also painted works in Florence for the Church of San Simone e Guida. Granacci’s burial was in the Church of Sant’Ambrogio, in Florence, 1543.